Our products support the development of your babies in a playful manner and invite your baby to cuddle and discover them. Out production is strictly supervised, we therefore guarantee the best possible quality. Babies love colours! We therefore put our focus on colourful products that transmit the whole spectrum of colours. We do help newborn babies to stimulate and practice their visual sense by intense colours and intentionally make use of contrasts as these are detected very intensely. Your baby can make a wonderful voyage of discovery by exploring all the musical chimes, small mirrors, teethers, crinkly paper, squeakers and rattling sounds and can permanently make new experience. A cuddly teddy is never a cuddly toy only, but much more. Like this, auditory and tactile senses and motoric skills are extremely well promoted. 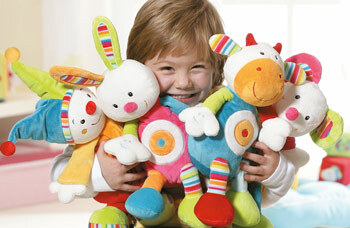 We manufacture toys with a high cuddle factor. 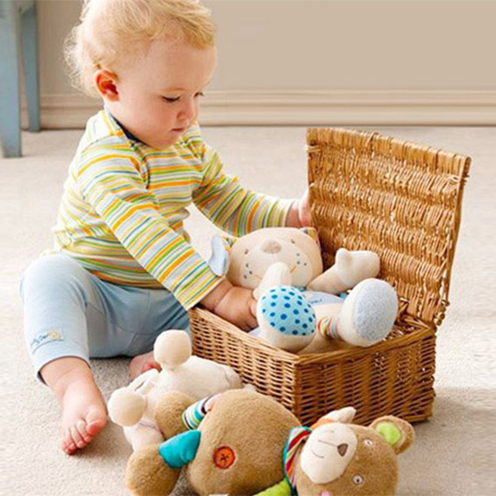 Our products are not only super soft, they also put the scientifically proven baby schema into practice: big faces, round big wide eyes, clumsy paws and a soft tubby belly – most of our characters are highly imaginative creatures from the realm of cuddly toys.